In addition to Lovettsville’s year-round community effort to collect food donations for those in need, residents now have another opportunity to lend a helping hand. Sue Cangemi last month installed the county’s first Little Free Pantry on the side of the Lovettsville Historical Society & Museum on East Pennsylvania Avenue. Residents can stop by and stock the 2-by-4-foot pantry’s three shelves with non-perishable food and toiletries for the area’s less fortunate, who can stop by and get what they need. Unlike conventional food pantries, the Little Free Pantry provides those in need with 24/7 access to food and everyday necessities. There’s no sign-up required and no operating hours to follow. Anyone who’s struggling a bit can swing by the pantry, open its glass doors and take what they need at any time of day. “This is perfect for that,” Cangemi said. Because the pantry is outdoors, residents are asked to refrain from donating canned and jarred food items during the winter. Instead, they can donate items like boxed macaroni and cheese, granola bars, cereal, peanut butter and jelly in plastic containers, dried fruit, baby formula, paper towels, shampoo and soap. Cangemi’s drive to install the tiny pantry came after conversations with her daughter who lives in Iowa—a state that has 12 Little Free Pantries. Late last year, Cangemi saw a community need for the pantry, when she and a friend noticed a homeless woman following them around as they worked to collect personal care products and bottled water for Texans affected by Hurricane Harvey. “Even though we don’t believe there are homeless people in our area, there are,” she said. Mayor Nate Fontaine said that the pantry is a vital fixture in the community and that the Town Council had nothing to do with it, aside from a unanimous approval that allowed Cangemi to install it on town-owned property. “This is wholly community driven—it absolutely is needed,” he said. Fontaine also noted that the idea behind the pantry is in line with community sentiment as a whole. In addition to having a permanent drop-off location for food donations to the Western Loudoun Food Pantry in the town office, the town’s scouts last month also collected 3,064 pounds of food in their annual Scouting for Food Drive. The New Jerusalem Lutheran Church’s youth group last weekend also held its annual Rise Against Hunger event to pack and distribute food to hungry people across the world. “There’s a lot of good things that go on in Lovettsville and [the Little Free Pantry] is just one little part of it,” Cangemi said. 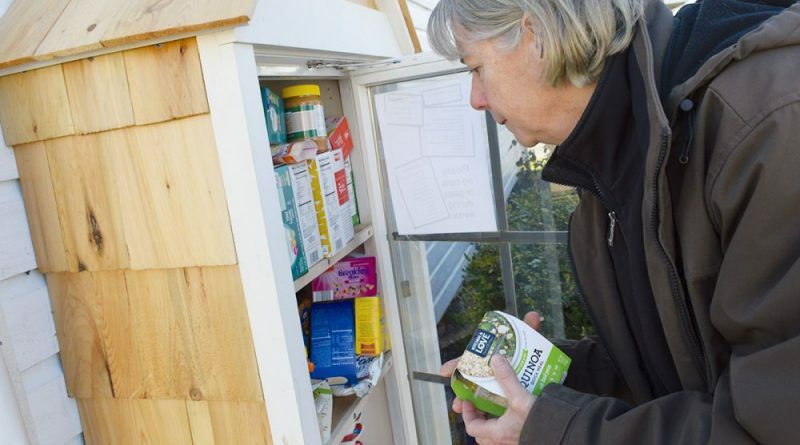 While 458 Little Free Pantries worldwide are listed on the project’s website, Jessica McClard, the installer of the first pantry, said that number is most likely closer to 1,500, since many aren’t registered. McClard installed the first pantry in 2016 at the Good Shepherd Lutheran Church in Fayetteville, AR, after being inspired by the Little Free Library—a project founded in 2009 that provides people with a free, 24/7 library. There more than 75,000 library locations in 88 countries, including 23 in Loudoun. It was when dozens of little libraries started popping up in her community that McClard decided to start her own project to feed mouths, and not just minds. With the pantries becoming so popular in the past two years, McClard said that she would love to see a situation where the pantries become obsolete because people are getting the support they need to live sustainable lives. She said the first step to the solution is education. “I would like to see others join me in advocating for systems that lift people out of poverty,” she said. To find out more about the Little Free Pantry project, go to littlefreepantry.org. 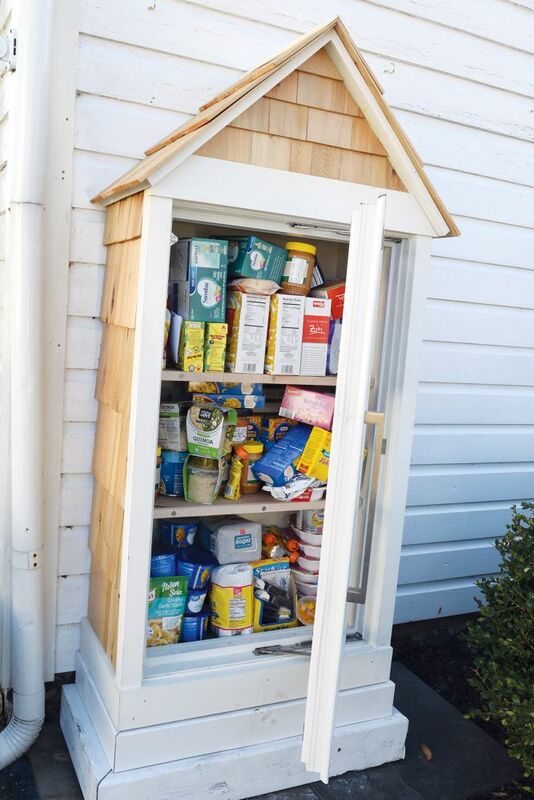 Loudoun’s first Little Free Pantry sits on the side of the Lovettsville Historical Society & Museum and provides those in need with 24/7 access to food and toiletries. Until I read this article, I’d never heard of a “Little Free Pantry.” This is a marvelous concept. I hope we create more of them in Loudoun and elsewhere.